I've built SO MANY funky and unique tree houses for clients that I felt it was about time to do a mini-workshop (all hands-on) on building and designing them- and I mean MINI. This workshop will be limited to a mere EIGHT people, and that's it! This will keep it very intimate and ensure that everyone gets a very large amount of actual building and construction contact- there's no quicker way to learn. We'll mix in a healthy dose of tiny house design as well- don't worry! Its a 12 hour class- one day, in a great NH town. 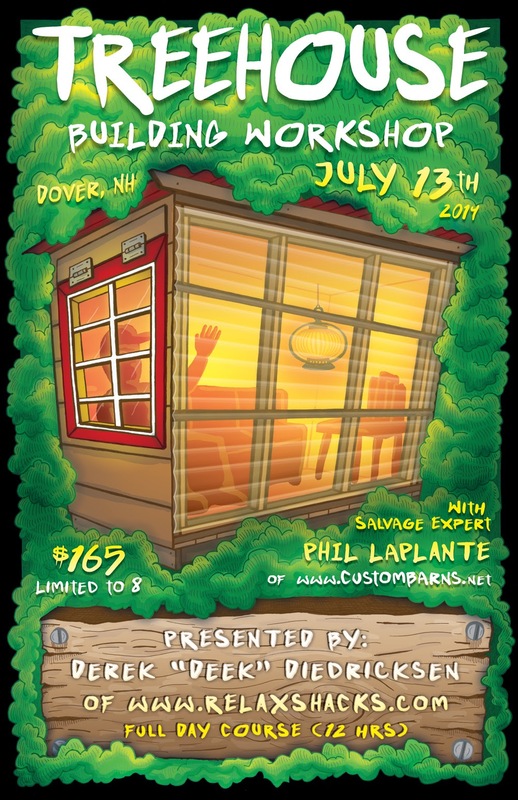 Our guest builder/designer is a guy named Phil LaPlante- from www.CustomBarns.net- he's a salvage and backwoods building junkie! Any questions- email me at kidcedar at gmail.com too….